We know chandeliers can cost a LOT of money. So we decided to create one of our own that looks like a million bucks without the price tag and show you how you can make your own. 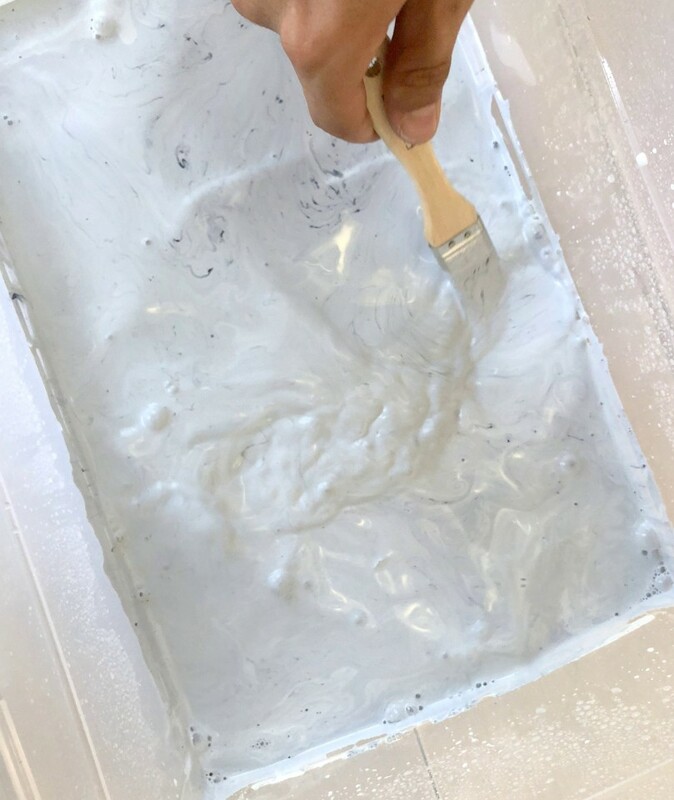 While we choose shades of blue and grey for ours, you can personalize it with any Fusion Mineral Paint of your choice and we have lots of wonderful colors for you to choose from! 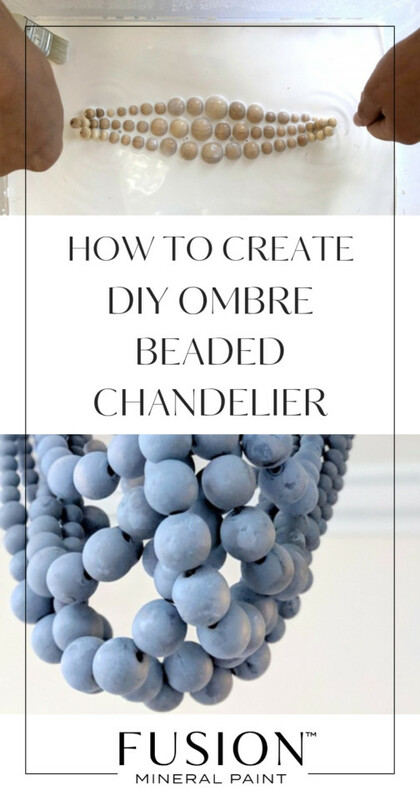 This DIY Ombre Beaded Chandelier tutorial is going to teach you how to make this colorful piece yourself. 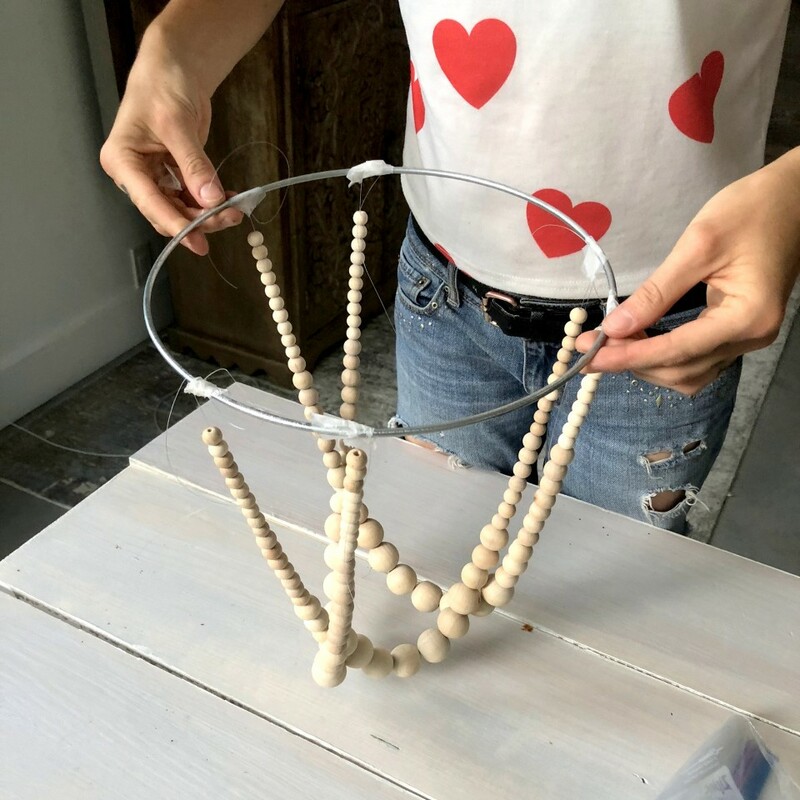 We were inspired by this beautiful DIY bead chandelier that The House That Lars Built shared previously but we wanted to add a little #PaintItBeautiful love. 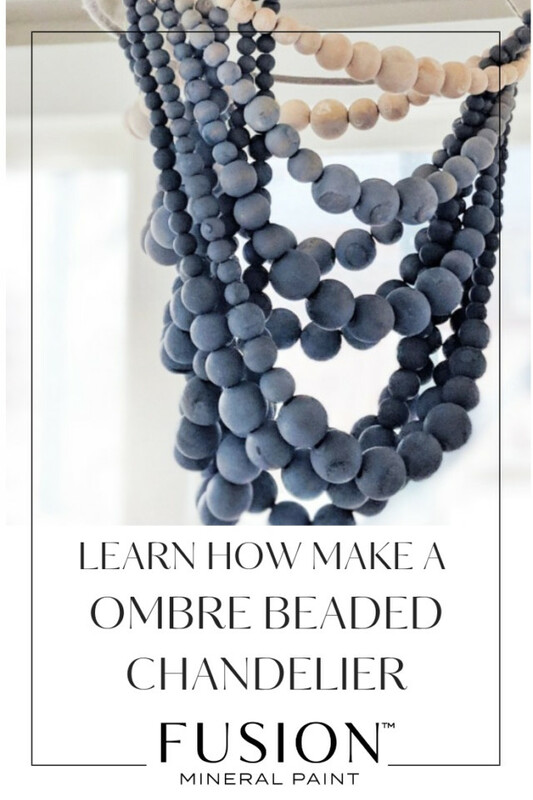 So let’s get started with our DIY Ombre Beaded Chandelier tutorial! The first thing you’re going to do is wrap your yarn around the metal hoop. Every so often as the yarn strand ends, just use a dab of glue from your glue gun to secure the yarn to the hoop until it is fully covered. Using your string (this is where you will thread your beads onto) measure out about 4x the diameter of your hoop. 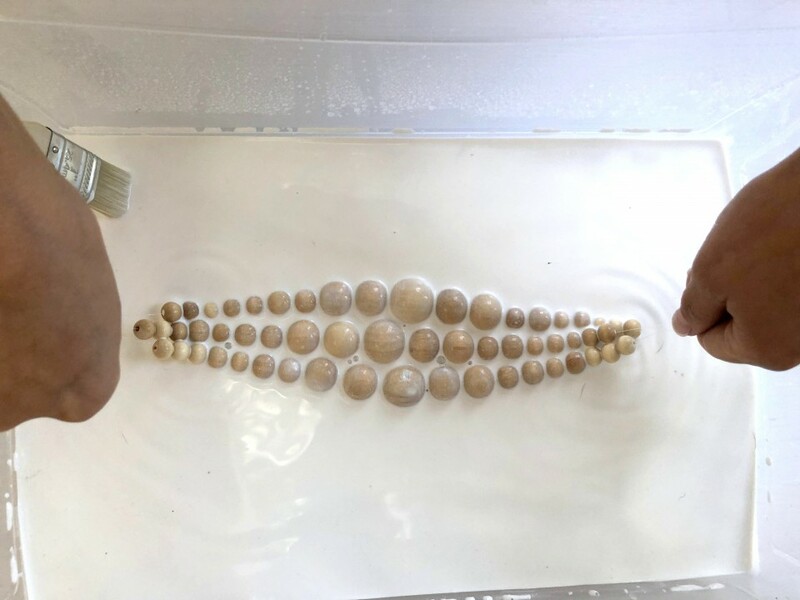 The most important thing is to ensure you that your largest beads are in the middle and to have the same amount of beads on each sides of the largest beads, so when it hangs, both sides of the beaded string are symmetrical. 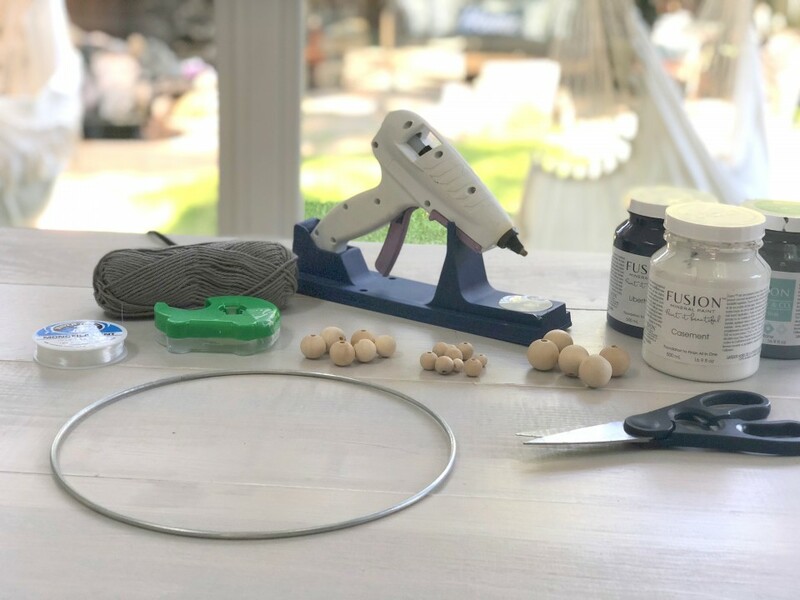 Your bead amounts may vary depending on the length you want per strand and also the size of your hoop that you are using. But the best way to determine how long you want your bead string to be is to hold it up by eye and then remove or add beads as necessary. 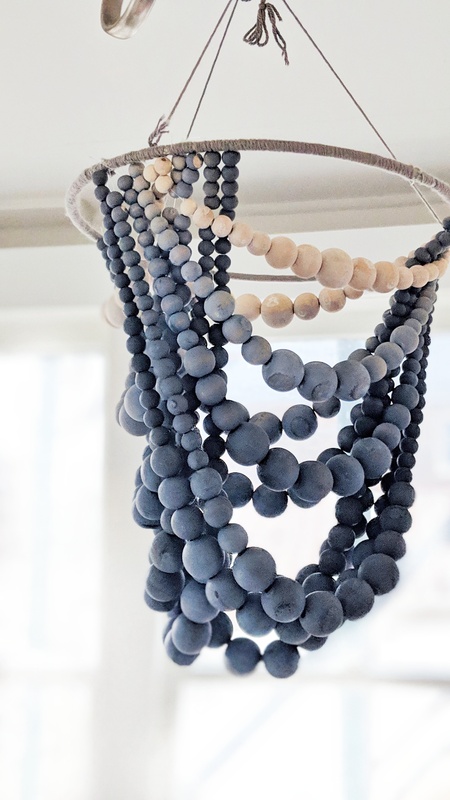 After you make two or three equal length strands of beads, tie the ends together in a knot (that you will later untie) to make sure they do not fall apart on you! We don’t want that to happen. This will leave you with “one” double (or triple) bead strand to use as you dye the beads and save you time as well. 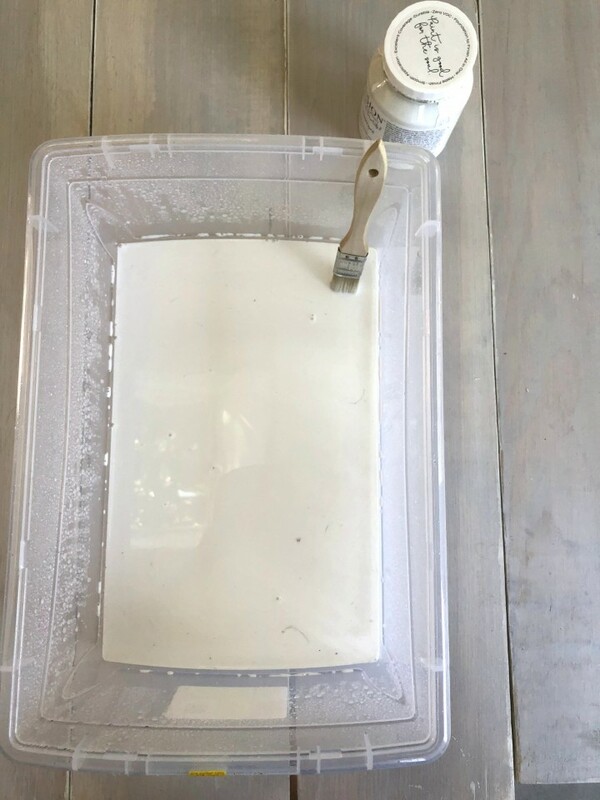 You don’t have to do this step if you’re comfortable enough using individual strands, but we just wanted to make sure the beads didn’t fall off of our threads accidentally during the paint process. 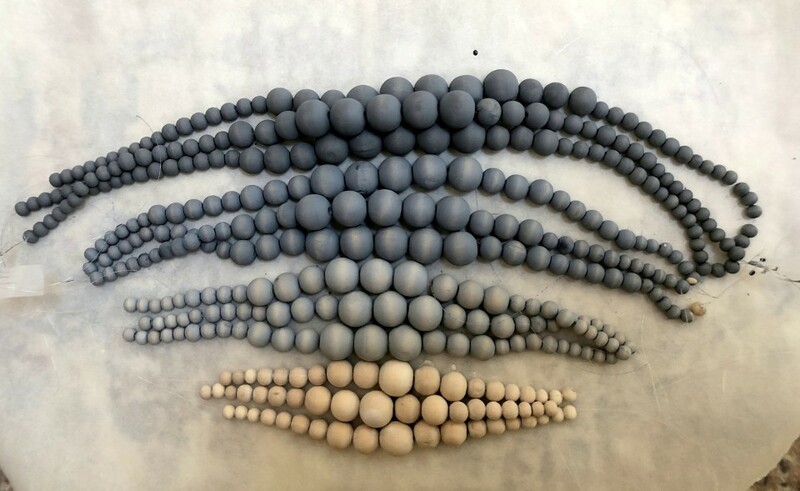 Time to paint your beads! Now we don’t know about you, but we didn’t have time to paint hundreds of little beads so an easy solution to this was to dye them. And it’s super simple to do. 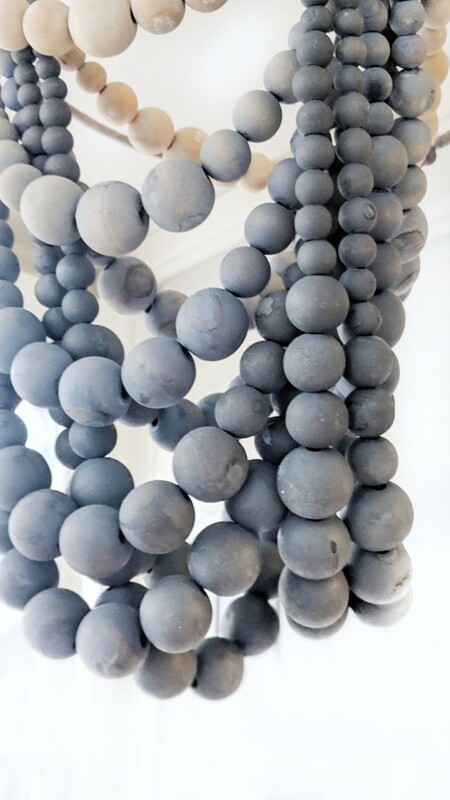 Take your Fusion Mineral Paint and pour it into a container, add a little bit of water and then dip your bead strings into the mixture. That’s it! They will dye easily and look fabulous. We went for an ombre affect with these and decided to go from light blue to dark blue for each joined strands. In the end we wound up making 4 different color strands, 3 lines of beads per each color. Now you’re ready to tie the strands onto your hoop. 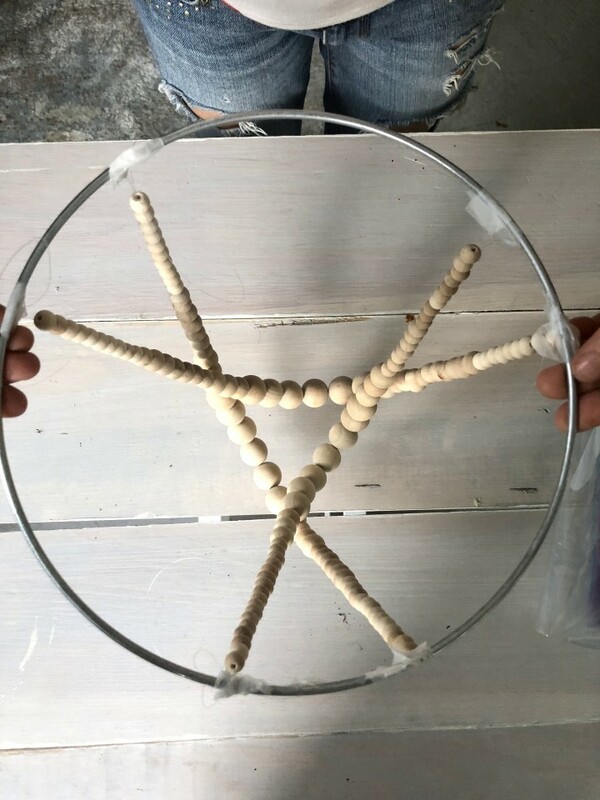 A simple trick is to look at the top of your hoop and imagine a triangle and then tie the beads from one end of the triangle to the other, overlapping each other as your tie the different strands. 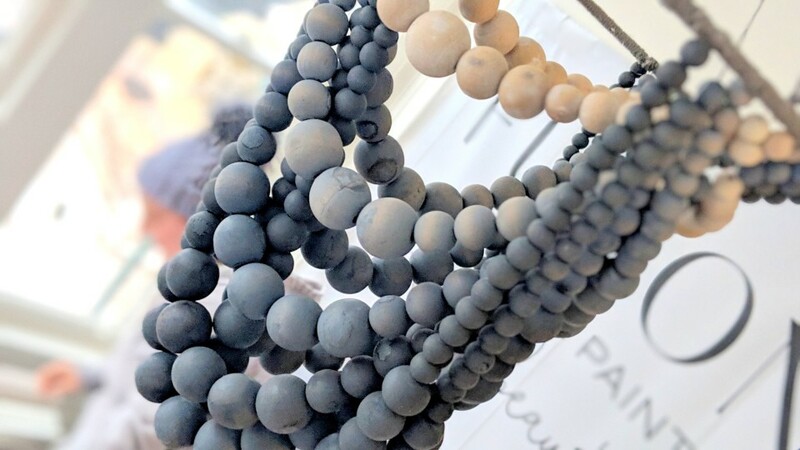 Start with your longest bead strands first and then work your way up to the shortest. 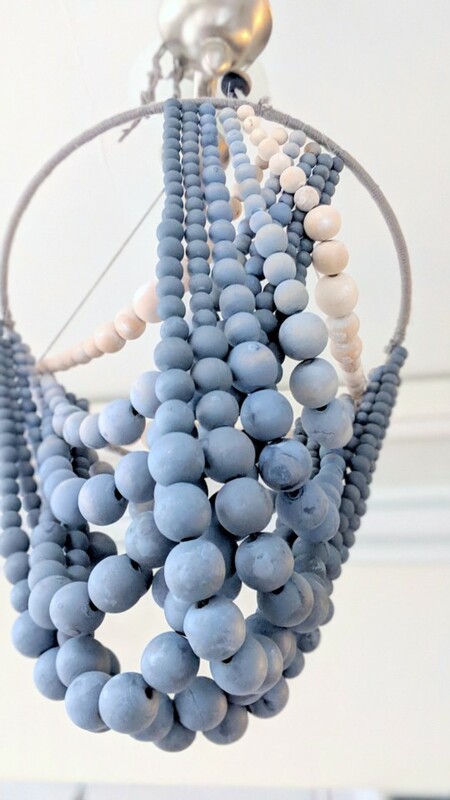 We took this photo during the making of process with an extra hoop before we dyed the beads, just to give you an idea of that triangle pattern and also to make sure we were happy with the hanging pattern. An extra set of hands is super helpful since it can be tricky to do this solo. You’re done! Hang your gorgeous new beaded chandelier wherever you’d like and enjoy! This tutorial is also featured on CoralTV where you can watch our very own Jennylyn Pringle make it in person!